Starting with the inauguration of Donald Trump and ending with the downfall of Harvey Weinstein, it’s little wonder that 2017 saw ‘feminism’ named Merriam-Webster’s word of the year. Be it opposing misogyny at the highest level or speaking out about their own experiences, Time Magazine took the temperature of 2017 when it crowned ‘the silence breakers’ its Person of the Year, paying tribute to the many women globally who found their voice in the midst of some of history’s biggest battles against them. Breanne Butler now boasts the huge title of ‘Director of States and Global’ for Women’s March, but last year she was also a silence breaker. Working as a chef, first at Facebook HQ and then in her own business ‘By Breanne’, Butler found herself a co-organiser of the biggest single-day protest in US history when she clicked ‘attending’ on a Facebook event for a march in Washington DC. “It still said ‘Facebook’ under my name on my profile so I think they thought I was an engineer or something because they were like ‘can you make all the pages for the states to come to DC’? So I just said sure, I’ll start doing it”. Within 24 hours people were reaching out to her from all over the world to plan their own marches. “We went from 20 cities to 200 in four weeks; it was crazy,” Butler tells me. “I always knew DC would be big but for me, the real moment was when Antarctica said that they were going to have a march. We had these female scientists messaging us asking for a toolkit, saying they wanted to do something there. That was when I thought ‘this is going to be unreal, like nothing that’s ever been done before’”. It would, of course, be impossible to reflect on the year in feminism without addressing the slew of sexual harassment allegations that began pouring from all corners of Hollywood and beyond following the Harvey Weinstein exposé in the latter part of last year. Naturally, Butler and the Women’s March are in full support of the Time’s Up movement that has emerged in its wake, turning words about unity and partnership into action by teaming up with some of its flag-bearers. “I mean, it really is about time,” she says. “In fact it’s overdue, it needs to be happening. And we’re partnering with them: we had Rose McGowan speak at our convention back in October and we had Asia Argento speaking at Women’s March Rome on Saturday”. The Weinstein fallout ended a year which began with Butler’s own Women’s March. Does she feel like they laid the groundwork? “I’ve definitely noticed that a lot of the language we crafted is being considered in statements like the one from the Time’s Up movement. You know: we’re focused on inclusion, intersectionality, standing with people with disabilities, standing with the most marginalised. I never really heard much of that before the Women’s March so to have set that kind of tone… that’s a really important conversation and I feel like we did bring that dialogue to the mainstream”. 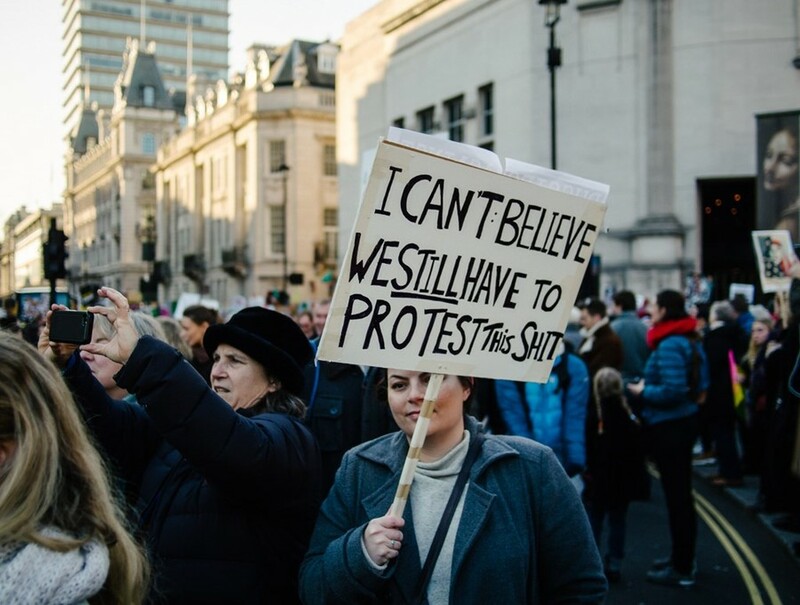 The issue of intersectionality was one that dogged the Women’s March in its infancy, with black women in particular raising questions about the representativeness of the movement. Today, its board is diverse in both ethnicity and background, with Butler pointing out that, for her part, it was her career in the restaurant industry that sparked a political awakening when she was asked to make cookies for a Hillary Clinton fundraiser. A year on and Butler and her colleagues are still fighting the Trump presidency and the values it represents. This year’s Women’s March theme for the USA was ‘Power to the Polls’, a concerted effort to get women voting and the ‘right’ candidates elected in the midterm elections. It’s for this reason that it will take place in Las Vegas, in battleground state Nevada, kicking off a national voter registration tour which Butler assures me will tackle the issues of voter suppression and turnout amongst women “even if that means literally calling Ubers for people on polling day”. “It’s really exciting and we’re so looking forward to getting started,” says Butler. “For a lot of women - for women like me - this past year was really just dipping our toes. We were exploring and embracing our voice and our impact. Now I’m ready to use what I’ve learned”.